Another nice offering from Microdeal is International Soccer, an exciting and well-executed sports simulation that you may play against the computer or against a fellow soccer fan. Another nice offering from Microdeal in International Soccer, an exciting and well-executed sports simulation that you may play against the computer or against a fellow soccer fan. Game play is unbelievably simple for a simulation involving large teams. The computer places a white rectangle beneath your team's currently active player, usually selecting the player who is closest to the ball. This is the player you control with the joystick, though, if you don't like the computer's selection, you may select another by pressing the joystick button with the stick in the center position. As the ball moves around the field, the computer will automatically switch control between the players so that you rarely have to select a player yourself. When one of your players gets the ball, he may then dribble the ball down the field or kick it. To dribble the ball you simply move the player, making sure you avoid contact with the other team's players. (They'll take the ball away.) Kicking is accomplished by pointing the joystick in the direction you wish to kick and then pressing and releasing the fire button. The longer you hold down the button, the harder you'll kick the ball. The ball is kicked when the button is released. If the ball gets too close to the goal, the goalie takes over. He is controlled by pointing the joystick in the direction you want the goalie to dive and then pressing the button. When a team is awarded a throw-in, corner kick or goal kick, the computer selects a player to do the job, then waits for you to press the space bar. While you are waiting, the players on the screen are constantly shifting position. 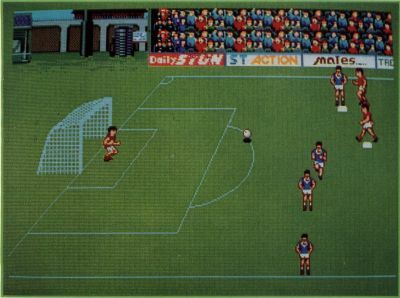 Also supported by the simulation are penalty kicks, where you may kick the ball either high or low, depending on the position of the joystick. This soccer simulation is carefully engineered for ease of play. You won't have to spend much time getting used to the controls, and you'll be an old pro within your first few games. The graphics are nice and the animation smooth— another quality product from Microdeal. Recommendation: If you like sports simulations, buy it.